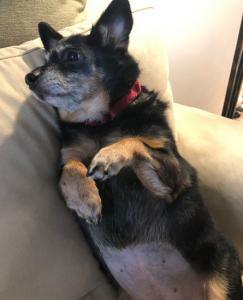 A DELIGHTFUL/SWEET GIRL: 8 years old / 18 lbs. and needs to lose a little weight Mostly Mutts adoption center is open Mon-Sat. 11-4pm. Some of us are in foster homes so please call 770-272-6888 1st to find out if I’m available to meet during the week. I’m a pretty easy dog - I get along with all the people I’ve met so far! My absolute favorite thing in the whole world is a belly rub and I’ll do anything you want to get one. I look just like a raccoon when I sit up on my rear end to make it easy for you to reach my belly. Or if it’s more convenient, I’ll just roll over onto my back when I’m on the floor. I’m just trying to make it easy for you! I’m pretty quiet and very affectionate, and I’ll follow you around to make sure you don’t get lost. I was in a foster home for a little while and initially I got along with the other dog there, but as time went by, I started some scuffles with him. Later, I met some dogs at the shelter, and I didn’t like them either. It seems that I just don’t want to live with another dog. Same with the kitty, so I’d love being your only pet! I met a nice 10-year-old boy and his younger sister at the shelter, and I didn't show much interest in them at all, but I think a home without children may be the best fit for me since I don’t get along with other dogs or cats. But if you have older kids and think I’d make a nice addition to your family we can meet and see how things go together. I have plenty of energy and love to go for walks, and getting that exercise is important for me since I need to lose a little bit of weight. I only had a couple of accidents in my former foster home and am doing very well on the shelter schedule now. I’m past the age of tear things up, though I did relocate a couple of shoes while in my foster home. LOL. I'll need my new family to help me learn that visitors to the home generally aren’t dangerous, so maybe you could help me with that. I tend to bark at them. Overall, I’m a total love bug and happy to go with the flow - so long as it includes belly rubs! I’m also a student in the Mostly Mutts University training program, and I’ve learned the ‘sit’, ‘stay’, ‘come’, and ‘go to your place’ commands as well as loose leash walking and proper door etiquette. Stay tuned for updates! I came to MM’s with bladder stones and my right eye is quite dry, so I’ll need medicated eye drops daily in that eye please. I had surgery to remove the bladder stones, and things are going well in that area now. I just need to stay on a special food to help keep the stones from forming again, it’s called Royal Canin Urinary S/O. I also had my teeth cleaned and a few pulled, so my mouth is feeling good! Energy level: 4-6. I'm current on vaccinations, micro-chipped, spayed, and my adoption fee is $299.00 which also includes an engraved name tag, Martingale collar and leash.